Modest Mouse has unleashed an immodest media assault in support of its fantastic new album, Strangers To Ourselves, appearing on CBS This Morning, The Tonight Show and others. Last night the band appeared on Jimmy Kimmel and raged through fervent versions of The Ground Walks, With Time In A Box and Wicked Campaign off the new album. 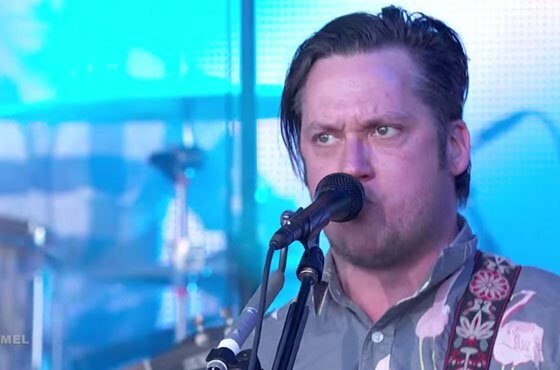 Isaac Brock’s eyes tell the story: it’s life during environmental wartime, and you better hold on. Great stuff from the always-reliable indie-rockers. Check ’em out below. Until we finally gave his music its due attention a few years back, we couldn’t fully comprehend the depth, beauty, sagaciousness and humility in the music of Sweden’s Jose González, whether solo or as a part of his fine ensemble Junip (watch a live sample of the latter below). You too might need some more time and a good introduction to González too. 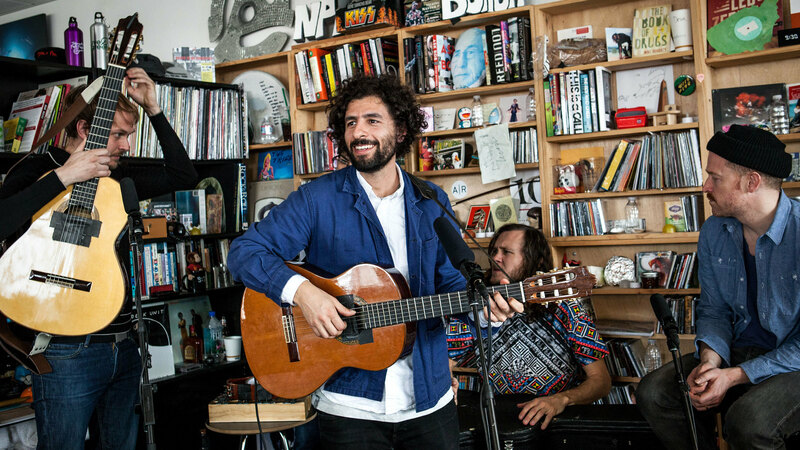 We can’t think of a better intro, with his ever-present nylon-stringed guitar and international backers, than the Tiny Desk Concert released today by NPR. Throughout his oeuvre, González asks (and attempts to answer) big questions and calmly cajoles the listener to contemplate bigger issues. Put another way: you probably won’t hear González’s songs covered on Modern Country Radio. His latest album, Vestiges & Claws, continues his superb string of recent solo and Junip albums, and is a must for your collection. Watch below as González and fine supporters perform three gems of the new album, including With The Ink of A Ghost (see the worthy lyrics at bottom), which González recently dubbed his favorite song. On this song, in particular, the ensemble delivers superb harmonies (at times realizing the unrealized promise of the Fleet Foxes, at others sounding like the finest touchstone, Simon & Garfunkel). They close with one of our favorite songs of 2015 so far, Every Age. It’s all not-so-simply mesmerizing. González is currently out on a sold out tour including tonight and tomorrow in Los Angeles. As we’ve said repeatedly, Dave Letterman’s nights as a talk show host are dwindling down to when he will end his tenure on May 20th. Letterman has been stacking the deck musically, and at the end of Friday’s show Jason Isbell, his wife, Amanda Shires, and Willie Nelson’s harmonica player Mickey Raphael, joined to pay homage to one of Letterman’s (and our) favorite musicians, Warren Zevon. The trio performed Zevon’s heart-rending Mutineer, which Zevon performed on the Letterman Show in his final public appearance (for the entire show that night) before he was taken by cancer. It’s not the first time Isbell/Shires have covered the song. Watch below, and then afterwards watch Zevon’s stirring performance of the song that night on the Letterman Show in 2002. Grab your coat–let’s get out of here. Not a dry eye in the house. And if you want to hear another reason why we sorely miss Warren Zevon, go HERE. 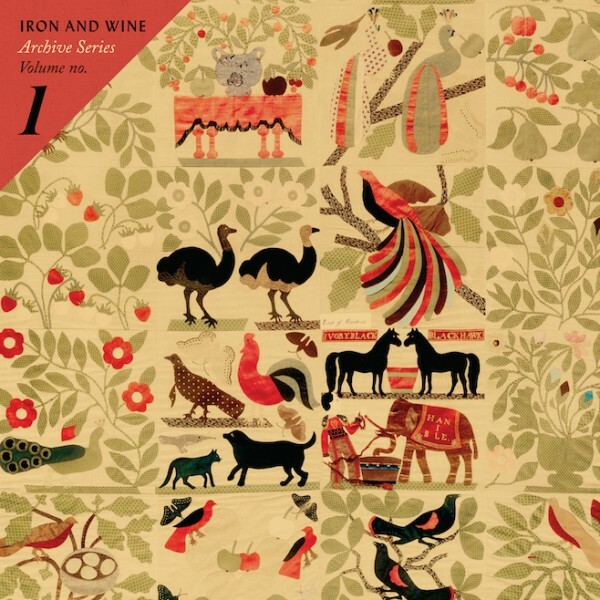 Sam Beam and his “band” of merriment known as “Iron & Wine” have delivered many of this generation’s best ballads, rockers and lullabies. Recently, Beam decided to back-fill his tremendous discography by releasing a previously-unreleased collection of songs entitled Archive Series Volume No. 1. The album consists of unheralded, great songs (all killer, no filler) that Beam put down on tape circa-2002’s semi-shocking smash debut on Sub Pop, The Creek Drank The Cradle. One of the many great songs from this tremendous Archive is Everyone’s Summer Of ’95. This track has now been imagined as a video featuring some dude (sorry) by the name of David Dastmalchian (evidently featured in a bunch of productions that YOU, dear person, CARE about immensely–us, not so much). The video is a bit of anxious daring-do in which the D-Dude jumps in briefly with some of his (imagined?) WWE bros (where is John Darnielle when you need him?) and escapes to who knows what? Still: the song. You know? Regardless, there’s never been a song written by Sam Beam that isn’t worthy of your strictest attention. He’s amongst our very best songwriters and lyricists, and the Archive Series proves this theorem yet again. Check out Eden, opener Slow Black River and all the rest of these salvaged beauties. And go HERE to pick it up. Next up in the Archive Volumes: the Covers, which Sam Beam does so well. 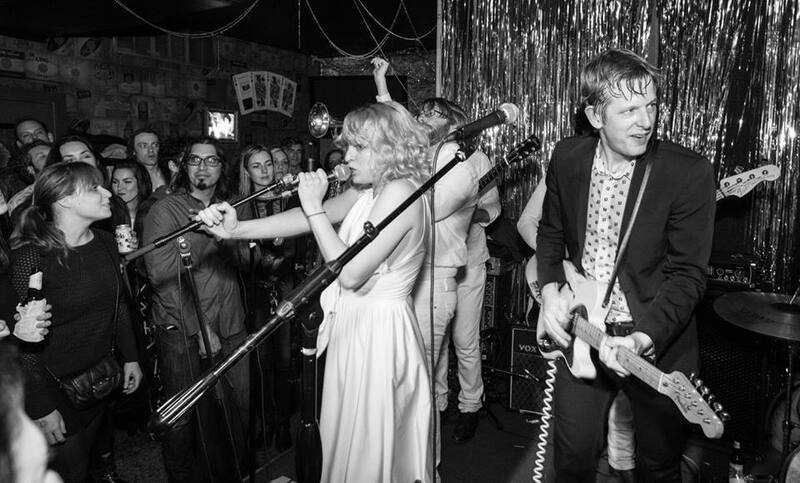 Austin’s Sweet Spirit is soon to be touring as openers for faves Spoon, and we can’t wait to catch ’em at the Wiltern in LA on May 30th. To further the intertwining of the two bands, Sweet Spirit and Spoon’s Britt Daniel recently collaborated on a great new song entitled Have Mercy, which you can listen to below (lyrics at bottom). Spoon’s frequent producer, Mike McCarthy, recorded the song and will produce Sweet Spirit’s debut album coming this summer. We love everything about Have Mercy, including Sabrina Ellis’s vocals, the synth-rumble, the clicking drums, Daniel’s/others’ multi-tracked harmonies. And especially that bass line that bubbles up intermittently. And the abrupt ending. A great track! The single is backed by Sweet Spirit’s cover of Spoon’s Paper Tiger. After Have Mercy, listen to another engaging Sweet Spirit song, Let Me Be On Top, off their current EP. Ewan MacColl was a seminal British folk singer, songwriter, communist, labor activist, actor, poet, playwright, and record producer. Amongst many great songs MacColl wrote (including Dirty Old Town, covered so well by The Pogues and many others), he wrote The First Time Ever I Saw Your Face (made famous by Roberta Flack). MacColl was recently (what took so long?) 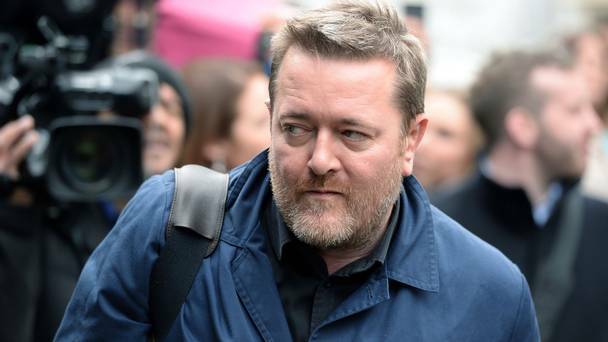 inducted into the BBC Folk Awards Hall of Fame, and Elbow’s Guy Garvey was there to render an evocative reading of the song, joined by Ewan MacColl’s sons Calum MacColl and Neill MacColl, and daughter-in-law Kate St. John, plus Duncan Lyall on bass and Harry Mead on percussion. Check the stirring performance out below. As the days dwindle down (20 as of today, but who’s counting) on the Letterman Show, the distinguished Dawes appeared last night and performed their valiant new song Things Happen, all in promotion of their fantastic new, Dave Rawlings-produced album, All Your Favorite Bands. Things Happen features the band’s signature melody lines and clever, incisive wordplay, coupled with superb playing and singing. In short: the whole package. 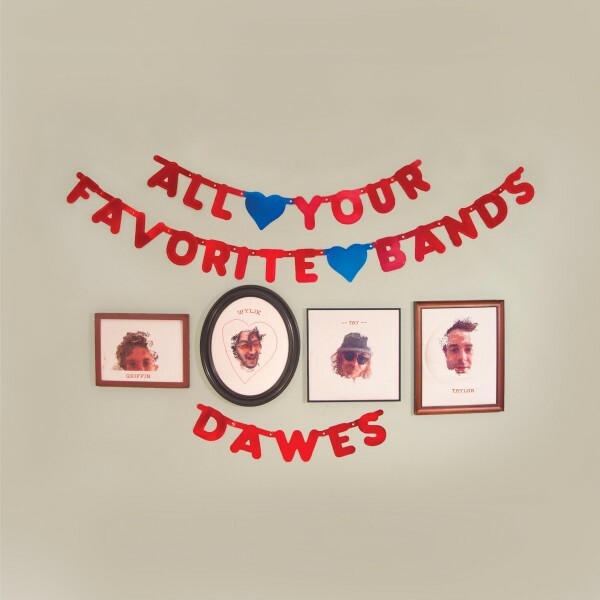 We couldn’t agree more with Letterman’s introduction of Dawes: “This is pretty much all you need in a rock ‘n roll band.” In addition to rending some of the best songs in rock, they are amongst our favorite live bands. Catch ’em if you can! All Your Favorite Bands, will be released on June 2nd via the band’s own HUB label. You can pre-order it HERE. After watching the Letterman performance, check out the song’s official video. A long, long time ago (OK, starting six years ago) there were the Black Cab Sessions in which musicians were captured performing unadorned in the back of a London cab. Some of our favorite vignettes were featured, such as HERE , HERE, HERE, and HERE. And then the cab seemed to have run out of petrol. Thankfully Black Cab is back thanks to the Guardian. 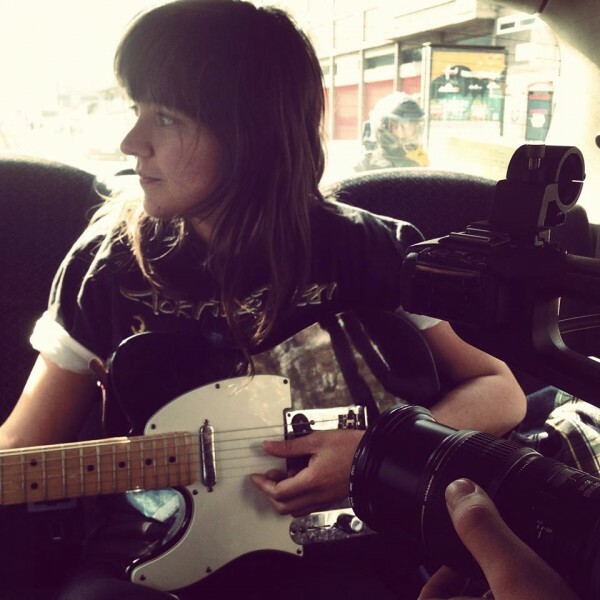 Featured on the most recent Black Cab Session is one of our favorite new artists, the gifted Aussie lyricist and musician, Courtney Barnett. The Decemberists are amongst our favorite musical acts. Ever. They’ll go toe to toe and pound for pound with any other act out there, and not lose anything in the melee. And yet we haven’t managed to catch them live heretofore. But come May 1st that void will finally be filled when we are up close to witness the band at the Greek Theater in Berkeley in support of their fantastic recent album, What A Terrible World, What A Beautiful World. To get a feel for their fine live form, check out their performances of The Wrong Year and Make You Better CBS This Morning: Saturday. For us there can be no better. Most impressive are Jenny Conlee and John Moen on Make You Better during the last third of that performance, and the harmonies. 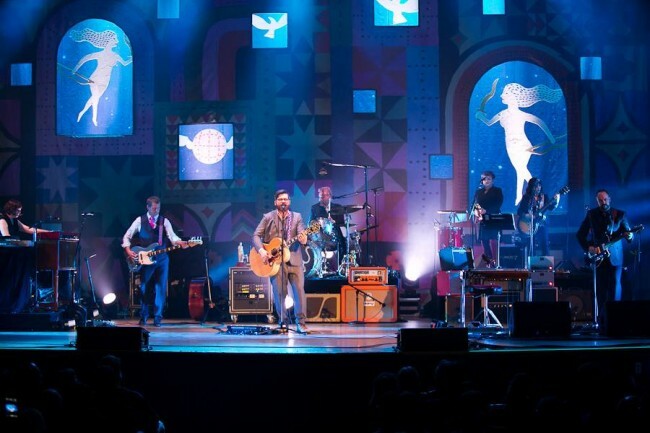 Colin Meloy and his love may not be “starry-eyed anymore,” but we are while watching this performance. Bring on the starry eyes and make it better. Please. The CBS player is bugged and bugging so if the videos below don’t play, you can go HERE and HERE to watch. Afterwards watch the same songs performed unplugged on CBC’s Studio Q. Unadorned beauty. There’s intense gravity and regret starting to register within, and it’s not out of character. 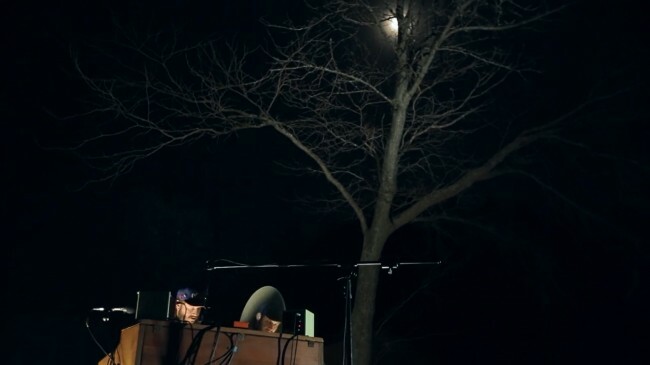 Bon Iver’s Justin Vernon is launching his first Eaux Claires Festival this summer in his heartland Wisconsin. The lineup is heavily Lefort-centric and possibly the highest-caliber lineup we’ve ever seen, including faves Bon Iver (natch), The National, Sufjan Stevens, Spoon, Low, Sylvan Esso, Charles Bradley, Field Report, The Staves, and many more). As of now, it’s highly unlikely we will be able to attend. We’ll try to assuage our regrets by catching Spoon at the Wiltern on May 30th. Can’t wait. 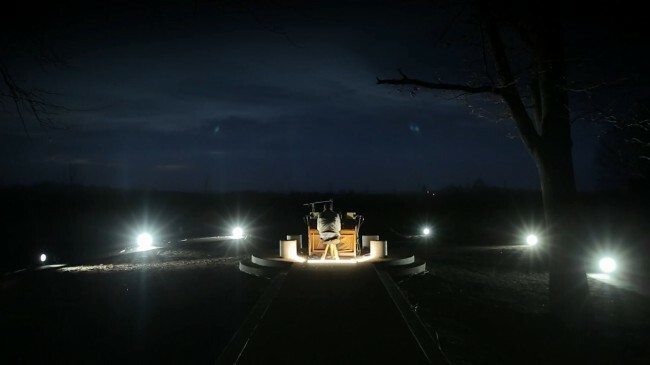 Yesterday, Vernon upped the ante on our Eaux Claire-angst by releasing the video below of his superb solo performance (we assume at the festival site) on a moon-filled night of Spoon’s great song Inside Out. Check it out below. There’s musical alchemy right there. We love everything about it, save the brevity. After the video, listen to the just-released, spare demo of Inside Out by Spoon (from a superb Song Exploder session a few months back). The song’s lyrics are at bottom. Though Britt Daniel might disabuse us of the notion, we don’t share in the anti-faith interpretation of the song’s lyrics. We prefer to read the song as professing belief (in the big “you”) while resisting organized religion (otherwise the “holy rollers” stanza stands out of place and seemingly without context). But that’s just us. Regardless, it’s a great song on a fantastic album.